For Spy Vibers who grew up in the States reading comic books, it's especially fun to see how other countries approached sequential art- especially when it comes to classic 1960s tie-in projects. TV 21 and other UK titles featured beautifully painted pages and the British comics overall tended to use more of what Americans might call an illustrative style. 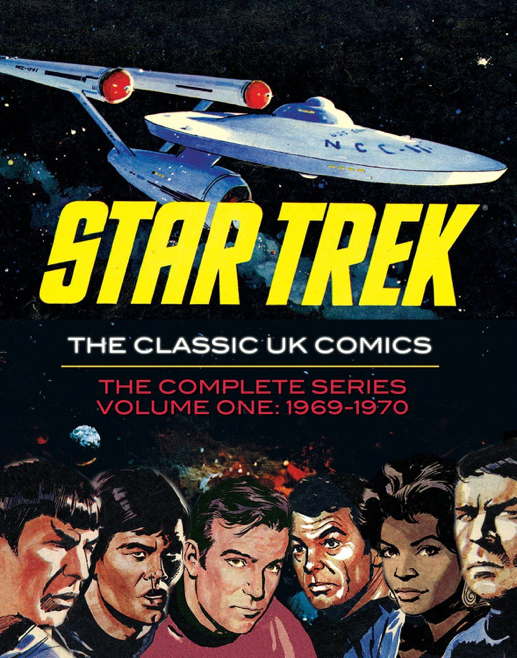 IDW has been publishing a 3-volume set of books to collect the UK Star Trek comics, and I bring it up today because Bud's Art Books just announced a sale that includes Vol. 1 in the series at a discount price. From the press release: "In 1969, six months before the Star Trek TV series premiered in England, British comics readers were introduced to the characters in an original comic book series. The stories were serialized, generally 2 to 3 pages at a time, in 257 weekly magazines spanning five years and 37 storylines. Handsome painted artwork in the style of Frank Bellamy. 17 complete adventures. These extremely rare comics have never been published in the United States. Star Trek fans will quickly note that the comics were not written with strict adherence to Star Trek's core concepts. The Enterprise frequently traveled outside our galaxy, and the crew committed many violations of the never-mentioned Prime Directive along the way. Spock shouted most of his lines and often urged Kirk (or "Kurt," as his name was misspelled in early issues) to shoot first and ask questions later. But it's precisely that "offness" that makes them so eminently readable and deserving of a proper reprinting. They're unique in the annals of Star Trek and fans have gone without them for far too long." More details at Bud's Art Books. You can read a review at 13th Dimension. Related post: Star Trek 50th. In other news, I have a new book out (over 700 pages!) about one of America's great cartoonists. Check it out! Enjoy!